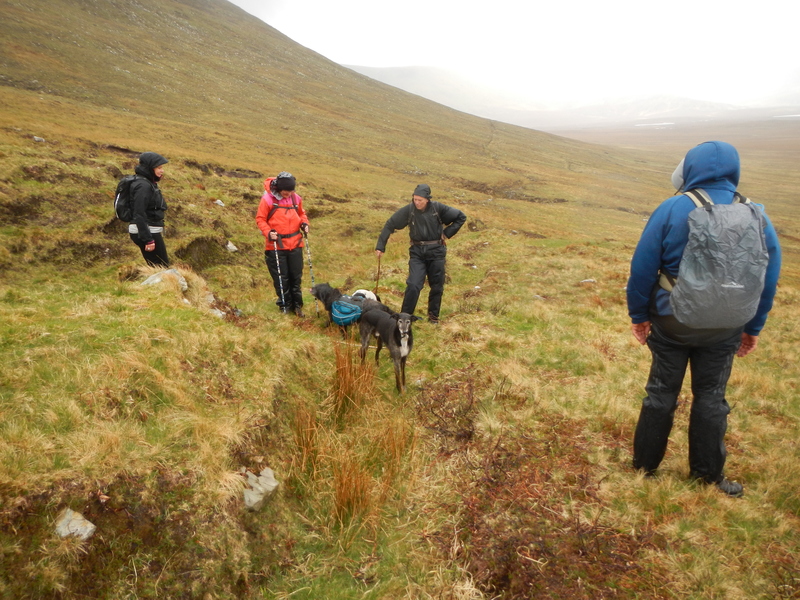 We were off to the wilds of Mayo last week for a trek across the Nephin Beg wilderness area through the Ballycroy National Park and the most “out there” spaces in Ireland. 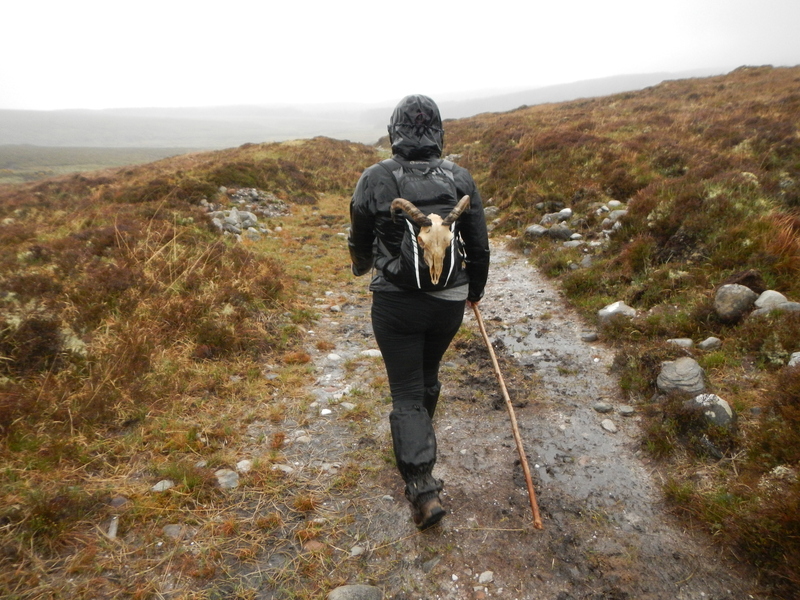 The trail, an old drovers road used for bringing cattle from the Erris peninsular and area to Newport market crosses 30km of bog and many many streams as it makes it’s lonely way along a route as far from any house or road as you can get. 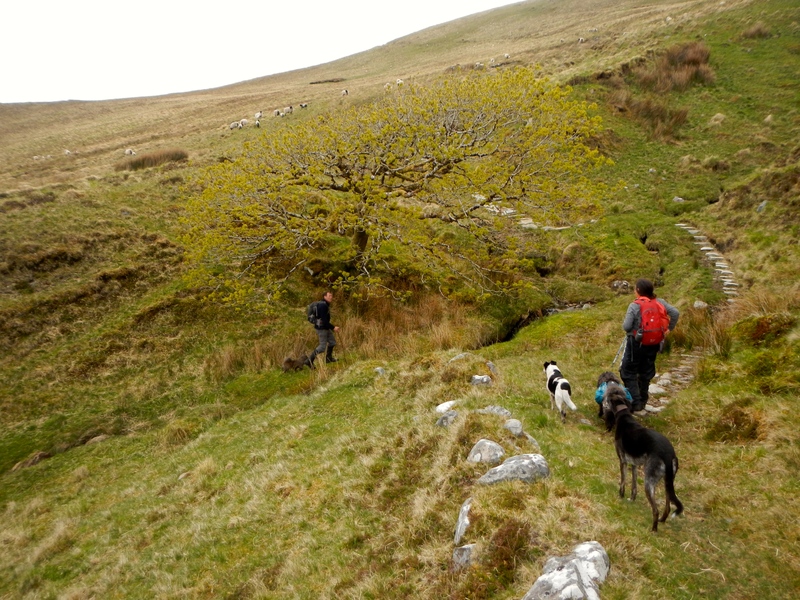 I’ve already posted a blog on this route from when i tackled it solo last September, camping out and making it a circular hike by returning on the Western Way but this time i was accompanied by trail buddies Mor and Beg Dawson, Ivor Bundle and The Missus as well as four dogs in a range from lap to hound. 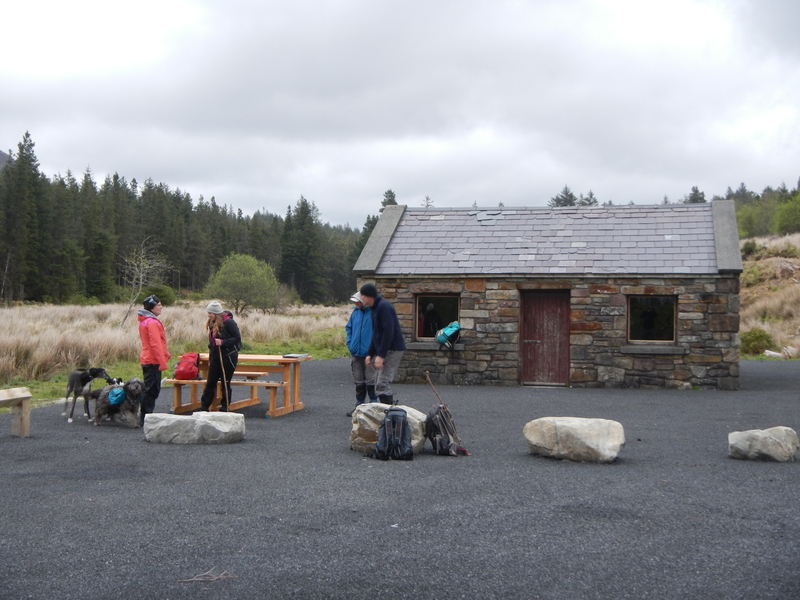 We started with a bit of a road trip in order to leave a vehicle at the finish in Bangor, driving up a beautiful road heading northwest from Castlebar past the 800m Nephin mountain before returning to the start of the hike at the little bothy at Letterkeen above Lough Feeagh. Heading out about 7 in the following morning we were hopeful the dry weather would continue although the skies were fairly leaden and the forecast was not great. 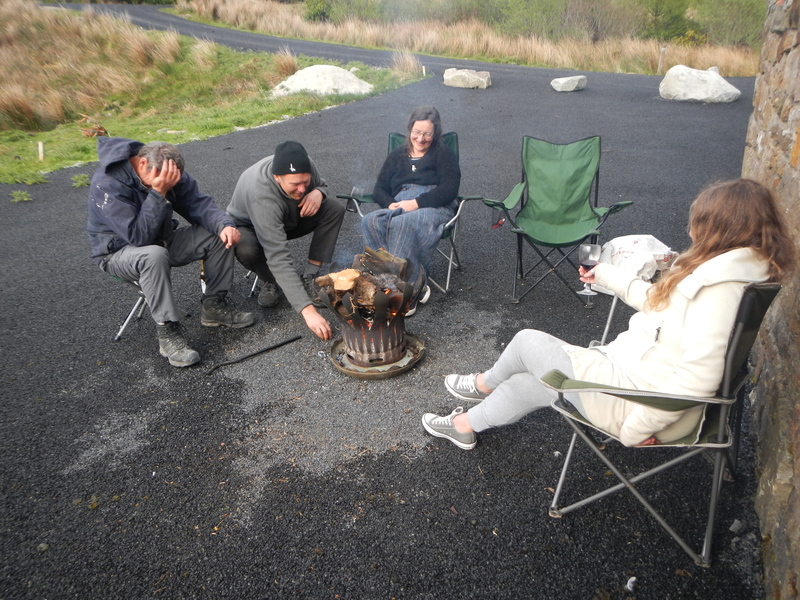 The area around the bothy has been spruced up with new tarmac and a wheelchair friendly path and decking over the bridge spanning the Attamoney river with picnic tables affording views of the surrounding Nephin Beg range of mountains.The invading rhododendron i had noted last time was just beginning to come into flower and another week would see the landscape turn purple. 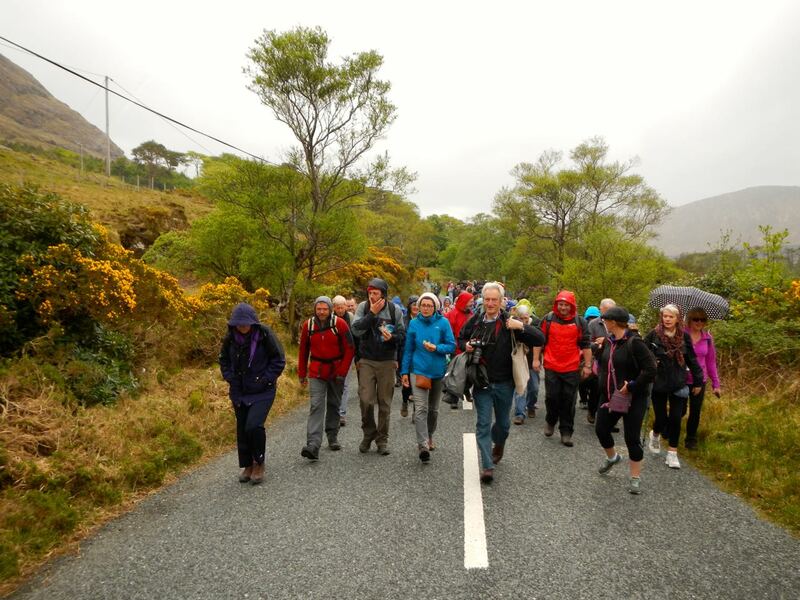 The beginning stages of the walk, as we headed north into the hills, were dry underfoot as the valley is covered by glacial gravel, apparently to a height 100m. In fact excavations on a rath here have revealed two periods of habitation and agriculture. Bronze age people were here perhaps 3000 years ago before abandoning the site to shrub and later the arrival of Early Christian farmers saw grain being grown in what is now a vast inhospitable bog. 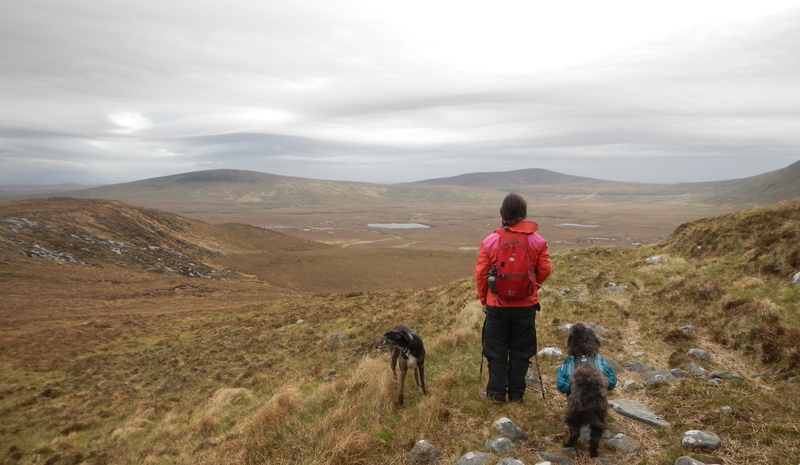 The strangely fluid venticular clouds added to the otherworldly atmosphere as we trekked over the shoulder of Nephin Beg and up past the only tree on the trail, an heroic oak with little chance of procreation. 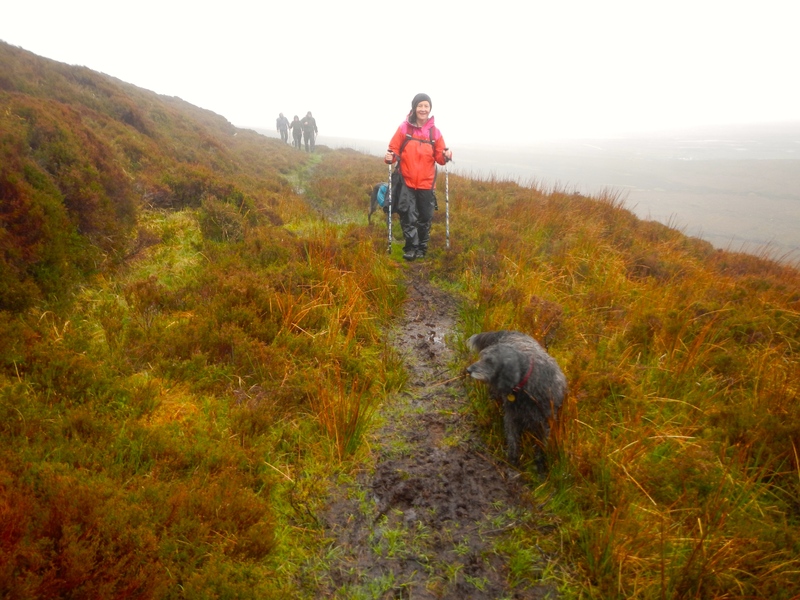 The trail was still furnished with stepping stones across the wettest sections here but soon these luxuries were gone, leaving us to squelch through the mire as the rain started to make it as wet above us as below. After passing the forlorn ruins of an ancient habitation we climbed another rise before coming down into the valley bottom to follow a stream where we found a relatively sheltered spot for lunch. 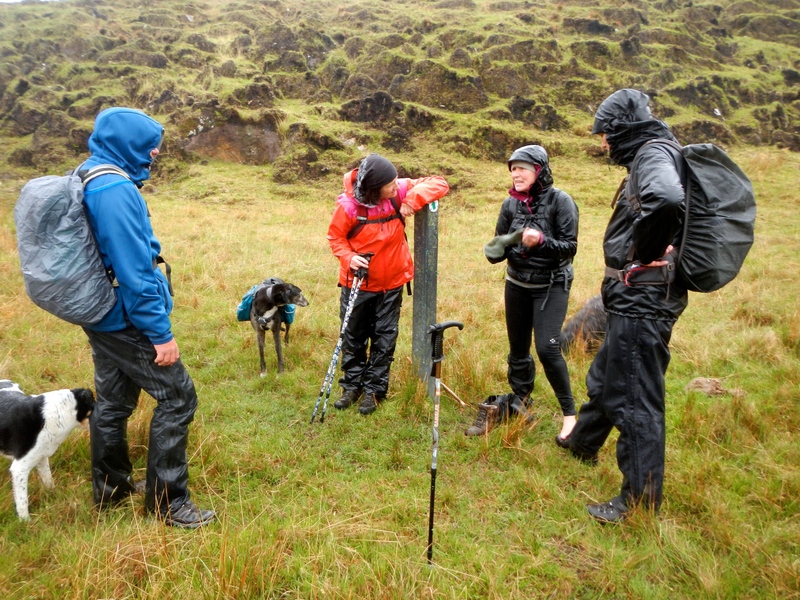 By now the wet had penetrated pretty deep and feeling chilly we didn’t hang about too long stopping only to empty boots of water. and to collect a momento. The next challenge was to cross the Tarsaghaunmore river where the footbridge was down which involved a balancing act on the remaining girder for some and a wet footed wade for others. From there the remaining 8 or so km were a bit of a slog through deep sponge occasionally relieved by wooden boardwalks and with the view reduced to a swirl of grey mist. 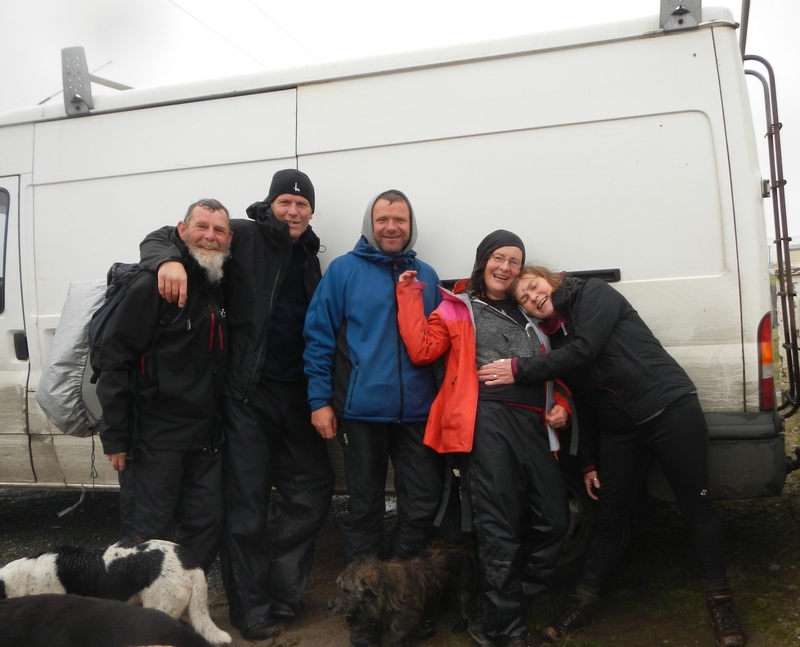 It was a relief to make it to the van at the finish and return to the bothy where we celebrated the heroic efforts of men, women and dogs. 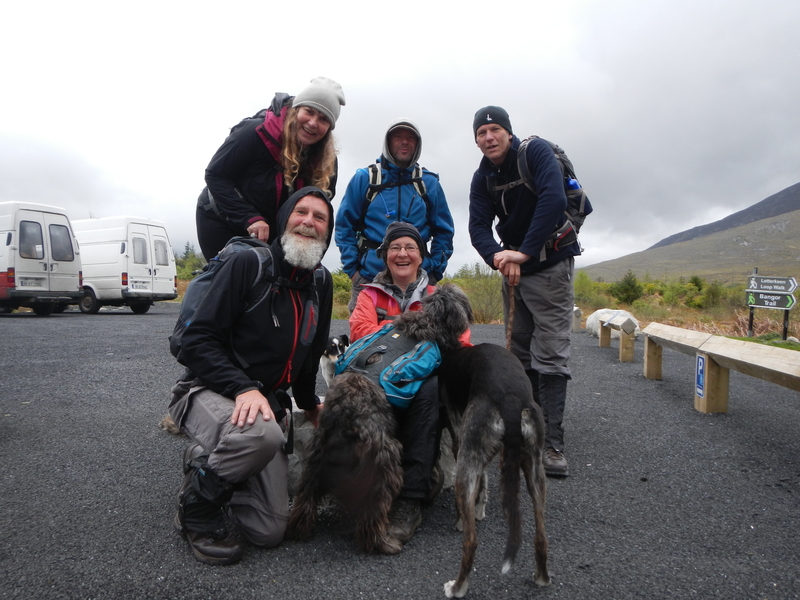 The next day Mor, Beg and The Missus headed home whilst Ivor and I drove down past Clew Bay and west along the coast under Croagh Patrick to Louisburgh to take part in the Afri Famine Walk. Afri are a 40 year old aid organisation concerned with global justice, peace, human rights and sustainability and ending poverty and hunger. 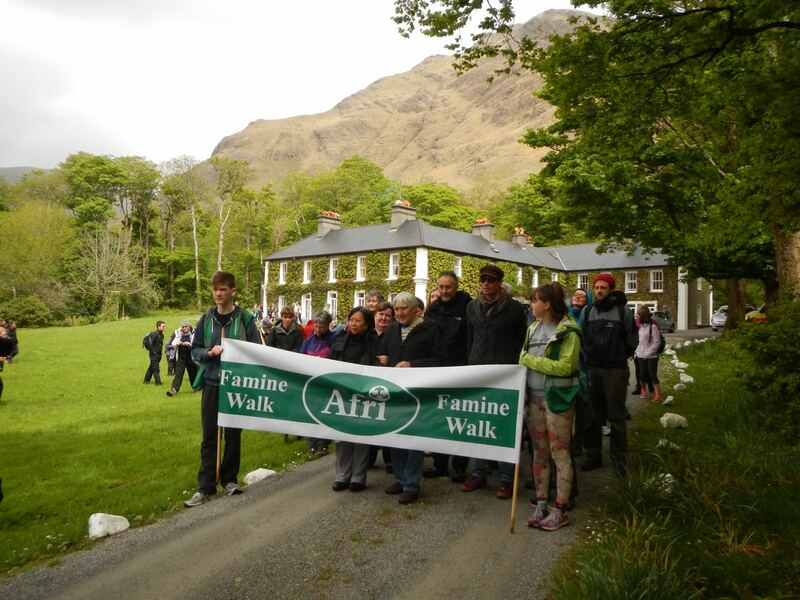 Every May for the last 27 years they have hosted a Famine Walk between Louisburgh and Delphi Lodge to commemorate and re-enact a tragedy that took place in the freezing winter of 1849 when dozens of starving died by the roadside on their way back to Louisburg after being turned away from Delphi Lodge where they had been told to walk to in order to receive food aid. Afri always invites walk leaders from a range of campaigns around the world to attend and this year a couple of hundred people gathered in the town hall to hear brief talks from family of Chelsea ( Ex Bradley) Manning the US whistleblower serving 35 years and Maitet Ledesma, a Philippino who works with an NGO that supports social movements all over the world. We were then bundled into buses and driven the 18km to Delphi where there was a tree planting ceremony before we headed off from the grounds of the imposing “big house” behind the leaders flags. 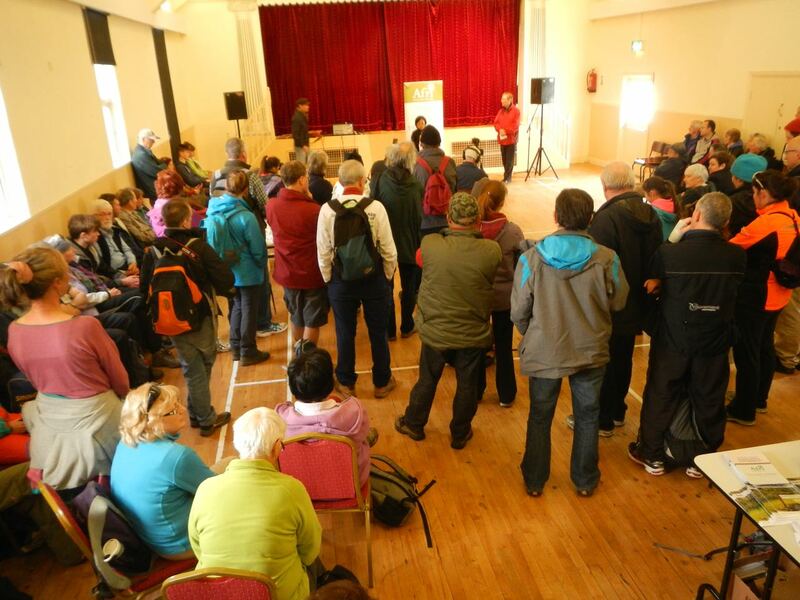 It was good to be walking in a large group for once, especially one with a political or humanitarian aim. Hiking with a conscious purpose to protest or bare witness has an honourable history and a great power to it. 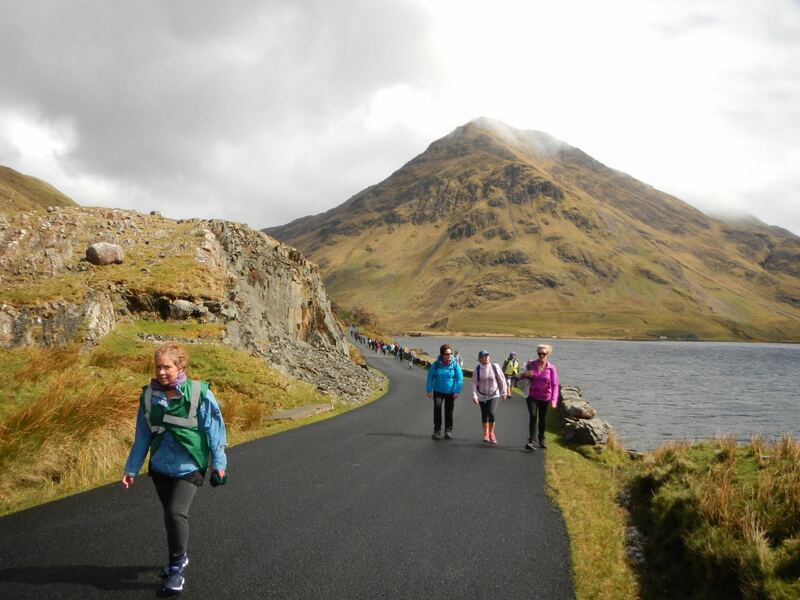 However we were on a tight schedule and the pace was too slow for us so we pulled on ahead and set off down the side of Doo Lough where it was fitting to experience a couple of freezing showers of rain and hail. 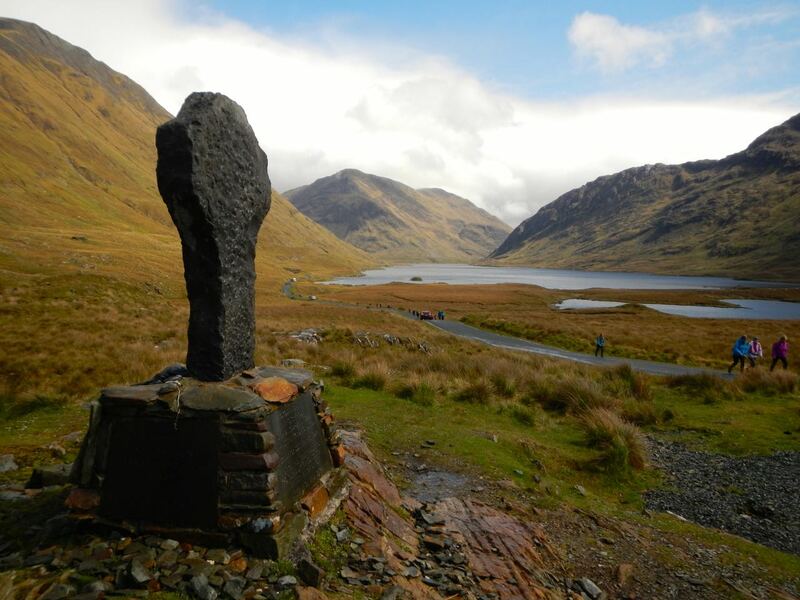 The countryside was dramatic and as we climbed to the top of the rise and the Famine memorial i looked back to the straggle of walkers and tried to imagine the horrors of the journey in 1849, but it was too lovely in the sunshine. 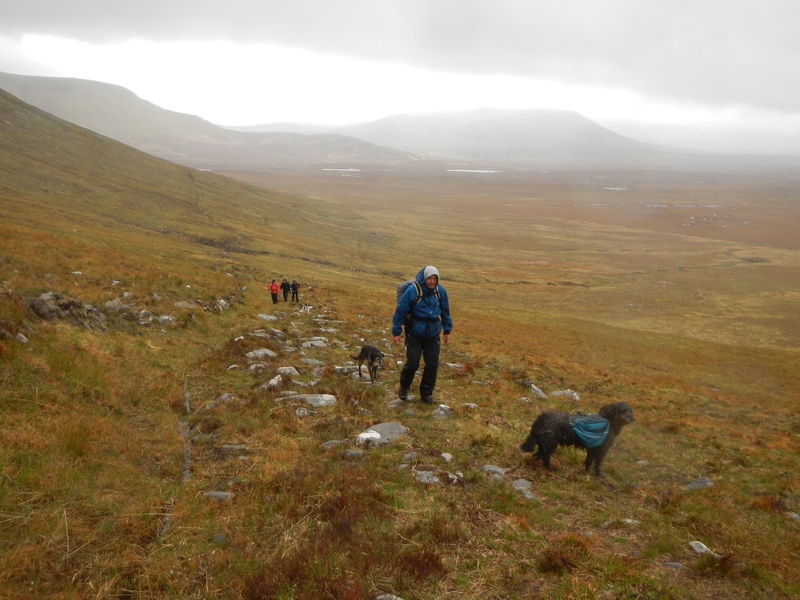 Once away from the lake we headed north across the bogland with fantastic views of Croagh Patrick but unlike the day before we were walking on a hard surface, in fact by the time we had made it back to Louisburgh my knees were complaining slightly. 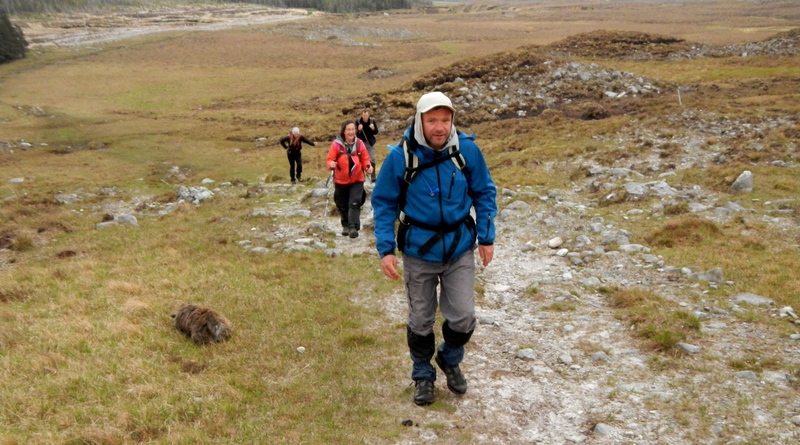 My suffering was put into perspective by a reminder of the history of our walk.